Rectangular bathtubs are in, corner models are out, and chromatherapy has changed the bathing experience by adding mood colors. Those are just some of the fun, quirky facts that experts at Mansfield Plumbing are sharing related to their bathtub manufacturing experiences. “The rectangular shaped bathtub is currently our highest-selling shape, followed by ovals,” says Haley Davis, product manager with Mansfield Plumbing. “And, at the end of a long day, apparently most people enjoy a stimulating whirlpool tub to ease away tensions, since those are our highest selling bathware products. 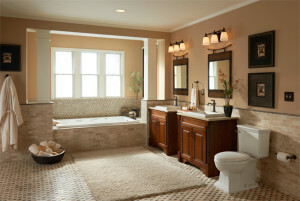 The company’s largest tub, the CastilleTM corner model, is 66 inches by 66 inches and holds up to 100 gallons of water. Bring a friend, because this tub has three separate seating areas. Forget about letting your tub air dry. The company’s ArianceTM and Pro-Fit Air massage baths have a purge and dry cycle. Twenty minutes after your bath is finished the blower will restart to blow warm air through the empty air channel and air injectors. This flushes out any remaining water droplets from the system and begins the drying process. How does Mansfield make its fiberglass reinforced acrylic tubs? With long chop fiberglass strands that are hand rolled twice to add strength and support to the tub. And, tubs are buffed before shipment to assure they shine upon delivery. If you desire a rejuvenating soak, opt for a Swirl-way basic or luxury whirlpool. A much sought after standard feature is the Hydro-v back jet system that targets the upper, mid and lower lumbar areas of the back to provide a custom massage.